Newly appointed Rye Sands Home Manager, Kirsteen MacKenzie, is excited about working in the community where she lives. “It’s an opportunity to come back to my own community – I’ve been living in Rye for more than 30 years now, my family have always been very involved in the Rye community and I saw this as an opportunity to come back and assist the Rye people”, said Kirsteen. 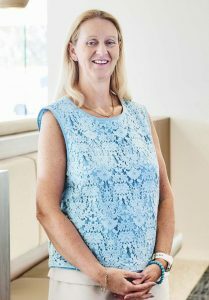 An experienced aged care home manager, Kirsteen has been a registered nurse for more than 30 years and loves her work. “I love connecting with people, hearing their life stories, sharing their journey, the joys, the tears, it’s all part of the human journey and I always feel very privileged to be allowed to share that with each resident and their family”, she said. Kirsteen said the opportunity to join Japara was too good to miss, “It’s an excellent company with a great reputation for valuing the individual and honouring their journey”. “I want Rye Sands to be a home of excellence on the peninsula – a place where people feel connected, where people are able to be themselves”. Already an active member of the Rye community Kirsteen wants to ensure the Rye Sands home is also a part of the local community, “I’m already engaged with the local fire brigade and the local church and I want to engage with the local primary school”. “Aged care is about working from the heart, I want to ensure our staff all share the same philosophy, so that the philosophy of the home is about supporting our residents – if we have 5 star staff, we will deliver 5 star service”. Ideally positioned in a quiet residential setting, and just moments away from the beach and town centre, Rye Sands is a brand new Japara aged care home for the Rye community. This modern home provides high quality care for up to 99 residents supported by around the clock care with individualised support and therapy plans, depending on each resident’s needs. The home has the benefit of at least one registered nurse on every shift 24 hours a day, 7 days a week. Read more under From our homes, Media.